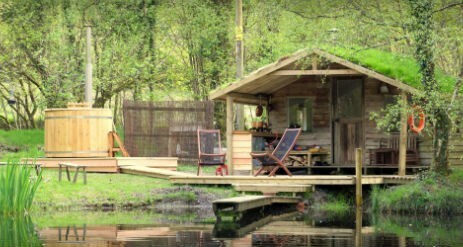 Gwalia Farm’s Cabin on The Lake in mid Wales, gleams under dark starry nights in the secluded wilderness. Gwalia is a traditional small farm set in the peaceful hills near Machynlleth, Powys. It’s an amazingly special place, loved by us and many, many guests over the years. It’s a family run with an abundance of wildlife supported by our environmentally sensitive farm. Say goodbye to concrete shower blocks, cars, electric hookups and flushing toilets. 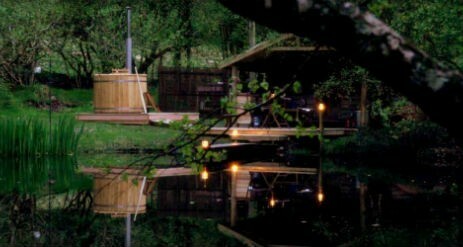 Say hello to beautiful dark nights, peaceful isolation, wild swimming, wonderful views and nature in its rawest form. 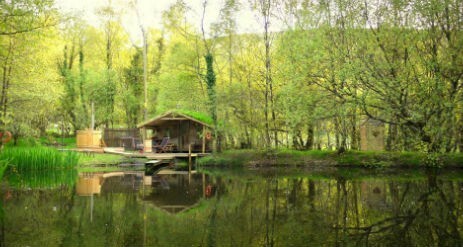 Our amazing cabin sits on the banks of our small lake with wonderful views over the lake and mountains. Sit out on the decking with a cool beverage from the powerless fridge and watch the wildlife pass you by just relax and be mesmerised by the water. 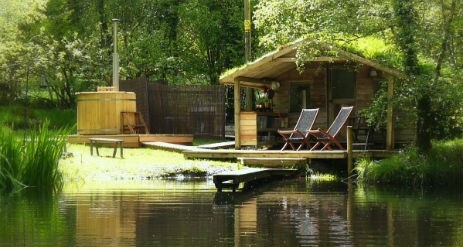 Take a trip in the canoe and paddle silently around the island or even stop off for a picnic. 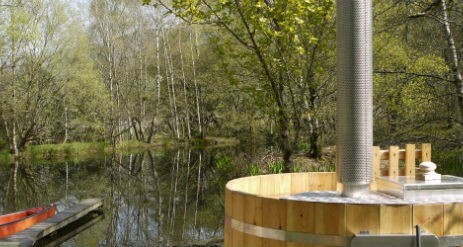 Rest in your own, private wood-fired hot tub at the edge of the lake, then dip in the cool waters if you’re feeling hardy. 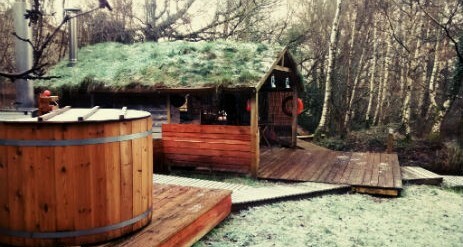 The cabin has a wood burning stove and a plentiful supply of firewood to keep you warm and toasty on cooler evenings. Everything we can think of is provided so that you can have a hassle-free, luxury stay. Experience the joy of camping in the outdoors with none of the packing! Your hosts are just a 100m away if you need anything just phone or knock and we can provide. It might be chilly, but the fires will roar and the hot tub will be as hot as you’d like as long as you keep the fire burning. The turf roof does provide some insulation, but the Cabin will get cold when the fire goes out so you may have to keep stocking it up with wood to stay warm and be prepared for one of you to get up in the morning to get the fire going again and the kettle on. We supply a thick down duvet, hot water bottles and extra blankets but suggest you bring lots of warm clothes too. The kitchen and toilet facilities are all outdoors although they are covered from the rain. We think the Cabin in winter is a wonderful experience, but it is still an outdoors experience so be prepared and pack the thermals! You can read a blog from some of our winter guests to give you good idea of what it’s really like. The Cabin is off-grid. We provide lots of candles plus torches and reading lights which we think makes for a lovely romantic experience but can be a bit eerie if you’re not used to it. We recommend bringing your own lanterns as well. In the deepest winter months it starts getting dark around 4pm and doesn’t start getting light again until after 8am the next morning. This is a wonderful opportunity for warm cosy nights snuggled in front of the fire or for moonlight evenings in a toasty hot tub. Also, listen out for the night time wildlife – there might be a badger or a fox sniffing around. Or the sound of tawny owls calling each other or this year’s chicks shouting for their parents. The darkness is completely dark, we are a long way from the nearest street lights so there is no orange glow at all. You can borrow a telescope for star gazing if you like. There are so many more stars visible when there’s no light pollution. On a cold, clear night I’m still taken aback by just how enormous and starry the dark sky is. PLEASE NOTE: Cabin is for Adults only. Sorry we do not accept dogs.